There are some ingredient combinations that get the attention of the pleasure-seeking part of my brain. Dates and bacon, chickpeas and cumin, and harissa or cardamom with anything, and I’m ordering it or making the recipe. It was exactly those combinations that played out in last night’s dinner. Lucky for me, my friend Josh likes making the entree and is happy to leave the sides to me. So when I told him that I wanted make a chickpea and date dish, barley pilaf, and a kale salad, he decided that coriander-spiced grilled lamb steaks would be just the thing. 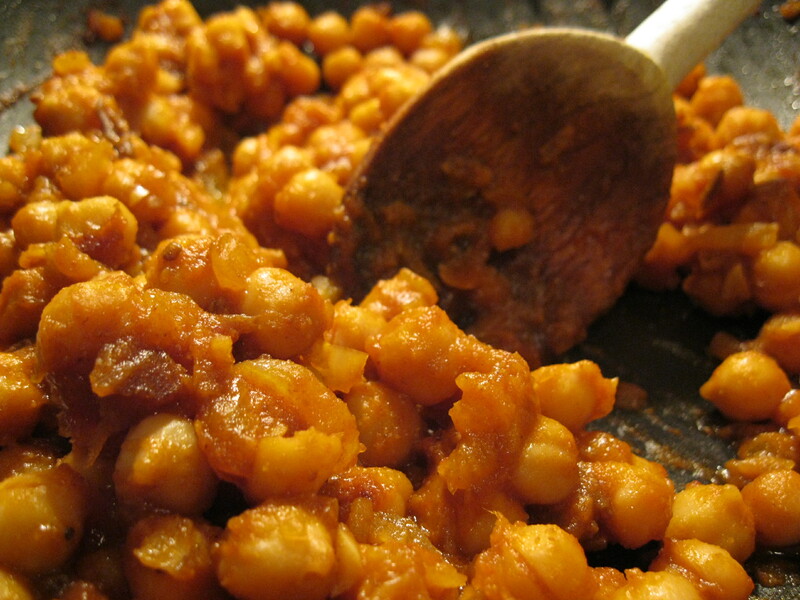 Before we talk about salad, I need to tell you about the chickpea in star anise and date masala. It got my attention because of the dates, which cook down and get caramely, and the combination of lots of cumin, cardamom, and a hint of star anise. This spiced chickpea stew is good company with grilled lamb and also works well as vegetarian entree along with rice or barley. Once you have the spices ground, it comes together in about 20 minutes and it can be made in advance and reheated. 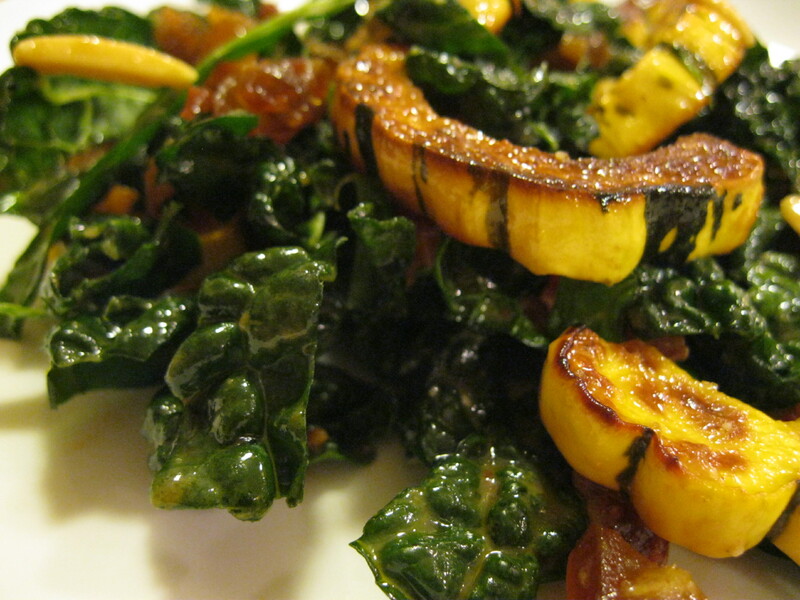 The harissa miso dressing in the 101 cookbooks recipe was the perfect salty, spicy friend for the squash and the kale. 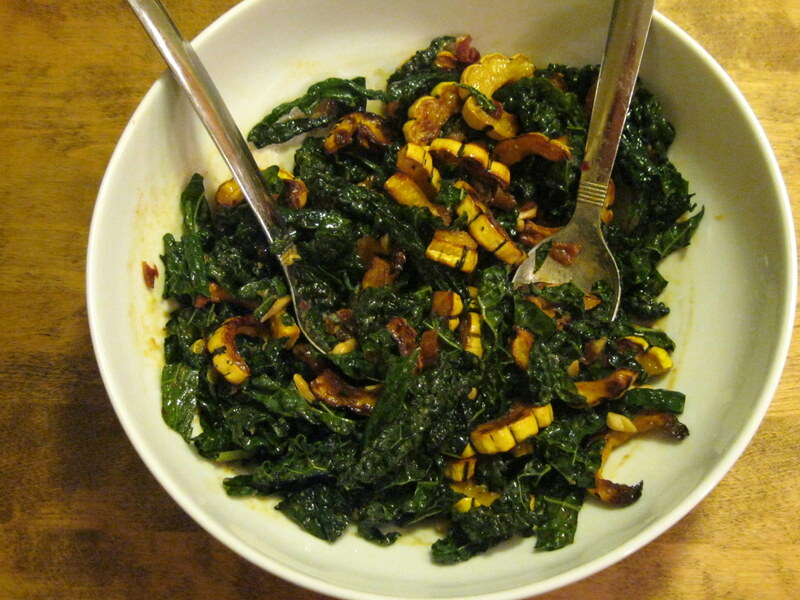 But what if it this dish was more about the kale than the squash, and it had some dates for sweetness and bacon for rich smokeyness? 1. Preheat the oven to 375 degrees. Make the dressing: Mix with a fork or mini whisk the olive oil, miso, harissa, and 1 TBS water. Prep the squash: If using a delicata, cut it in half lengthwise, scoop out the seeds, and slice into 3/4-inch moons. If using butternut squash, peel with a vegetable peeler, scoop out the seeds and cut into 3/4-inch cubes. 2. Toss the squash with a tablespoon of the dressing and put the squash on a baking sheet and into the oven to roast. Check after 12 minutes, turn over squash and continue roasting until they are lightly browned and soft. 3. Prepare the bacon. Line a large plate with 2 paper towels, lay the bacon slices on the paper towels, cover with another paper towel, and cook in the microwave on high. In my aging microwave, it takes about 4-5 minutes for the first side and nearly as long after I flip them. Cook until nicely crisp. Let cool and then crumble the bacon and set it aside. 4. Add the lemon juice to the dressing and add another tablespoon of water. 5. To assemble the salad, put a couple spoonfuls of the dressing on the bottom of the salad bowl. Add the kale and squash toss, adding more dressing as needed to coat the salad (you will probably not use all the dressing). Top with bacon, dates, and almonds and serve. This entry was posted in Healthy, Salads, vegetables by Amy. Bookmark the permalink.